In a large frying pan heat olive oil and throw in the chillies and cook them at med heat until they are BLACK (this is important). They shouldn't be burnt to a crisp just nicely blackened. Throw in the garlic at the last minute or so of cooking the ham so it doesn't burn. (Nothing worse than burnt garlic). Throw a ladle full of hot pasta pasta water into skillet about 3 minutes before pasta is done. Toss in broccoli. Drain pasta. 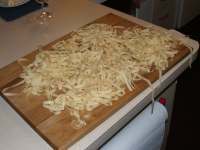 (You want a bit of water left in the pasta - it takes the cheese and turns it into a coating sauce) Throw hot cooked pasta into skillet. Toss for only 30 or so seconds. makes enough for 2 - we often make the sauce a couple of hours before cooking the pasta. In a small pot, heat about 1 Tbsp olive oil and throw in the chillies and cook them at med heat until they are BLACK (this is important). They shouldn't be burnt to a crisp just nicely blackened. In a large non-aluminum frying pan, heat 2-3 Tbsp olive oil. Throw in the sausage and cook until the pieces are quite brown and almost crispy (No...I'm not kidding). Throw in onions and saute til soft; add the garlic at the last minute or so of cooking so the garlic doesn't burn. (Nothing worse than burnt garlic). Cook spaghettini in boiling water for as long as it takes to make it al dente. (6 minutes?) Throw hot cooked pasta into skillet after draining. Toss for only 30 or so seconds. Mix flours together. Stir eggs in with a fork. Knead with hands to form a ball. Cover tightly with plastic and allow to sit on counter for a couple of hours. Put dough through handcrank pasta maker. 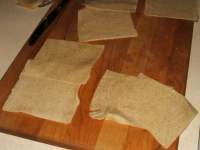 Leave as sheets for lasagne, ravioli and manicotti or cut each sheet into spaghettini or linguine. Lay loosely on a tray. Sprinkle a little flour over top to keep the pasta from sticking to itself. In a large pot, boil well-salted water. Add noodles cooking them until just tender (very short time). Drain and toss in your favourite sauce. Serve with your favourite sauce. Fresh egg noodles are wonderful tossed in butter and sage and served as a sidedish with grilled meat as well. Or tossed in butter and toasted poppy seeds to go with goulash or Beef Stroganov. They are also brilliant in Asian flavoured chicken broth.